Amazon SES is an easy and cost-effective email platform way for you to send and receive email using your own email addresses and domains. 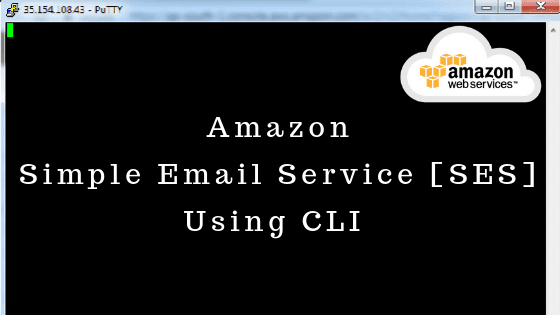 Amazon SES is AWS cloud base email service built on reliable and scalable AWS infrastructure. You only pay for what you used. SES Use cases: Marketing emails, Transnational email, Notifications and newsletters emails etc. If you want to create your large email solution for business then it's very complex and costly and also you need to manage email server management. Amazon SES eliminates these challenges and provide you a easy cost effective solution for bulk email service. SES service currently only available in AWS three below regions. Emails can only be sent to or receive from verified email address and domain to reduced Spam attack emails. To help prevent fraud and abuse, and to help protect your reputation as a sender, Amazon apply certain restrictions to new Amazon SES accounts. You can only send mail to verified email addresses and domains in sandbox account only. You can only send mail from verified email addresses to any other email addresses and domains in both case sandbox and production mode. You can send 1 email per seconds only but you can request AWS support to increase send rate limit for short period, not forever. Email send quota is 200 emails per 24 hours. You can request to increase this limit. To request that your account be removed from the Amazon SES sandbox check this Amazon tutorial. SES provides easy APIs and we can integrate it with other AWS services like S3, KMS, Work emails, SNS and Lambda. We can defines receipt rules to control incoming emails and route them. SES can route emails to AWS S3 or forward it to AWS SNS even process it via AWS lambda. Step 1: First of all we need verify email address. Once execute this command you will receive a verification email and click on link provided in that email to verify. Step 2: Now you need to verify receiver email id to receive emails. Again follow same step to verify receiver email address and verified it. Step 4: Now try to send email from sender email id to receiver email id. Note: Use supported region only if your default region is not supported SES. Always follow strictly email marketing and anti-spam laws and regulations in the countries and regions you send email to. You're responsible for ensuring that the email you send complies with these laws. Otherwise Amazon can ban sending and receiving emails.